A beautiful combination of sweet fruits. Arrange the melon slices, grapefruit segments, grapes and satsuma segments or orange slices on a large platter. 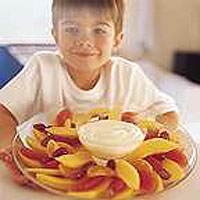 Sweeten the fromage frais with the sugar and vanilla essence and serve in a bowl with the fruit.